Adds an ability for select items by typing them names on the keyboard. Zoom to a map/material after placing it into the Slate Material (3ds Max 2014 and above). 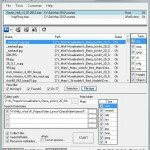 Fixes an issue with tracking assets for files opened from the 3ds Max ‘Start-up Template’ dialog. Fixed a minor issue with sorting items in the listview. Fixed an issue with clearing items in listView after closing the ‘Preferences’ dialog. 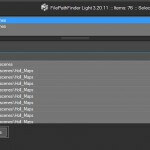 Related to "FilePathFinder Light v.3.12.11"